What happens when you choose a Northwoods’ casket? Locally sourced. Eco-friendly. Handcrafted. Reclaimed. Biodegradable. American Heritage Pine casket in Olde Wood. Like many Americans, you probably like these words. The big box stores know it and go to great lengths to entice consumers of food, clothing, and durable goods with marketing messages that appeal to your inner thinking that your purchase decision just might be doing some good in the world. For a small, locally focused, family business like ours, these words have far more meaning than our marketing department. (We don't actually have a marketing department.) These words characterize the very essence of what we do and why we do it. So you may be wondering, what is the real impact when a family decides to use a casket made by the Northwoods Casket Company. Rest assured the impact is significant and measurable. We plant 100 trees for every casket we make. Planting trees isn't a temporary marketing gimmick. This is a permanent commitment written into our business plan and fully embraced by every member of our team. We plant trees in state parks, state forests, and state natural areas. 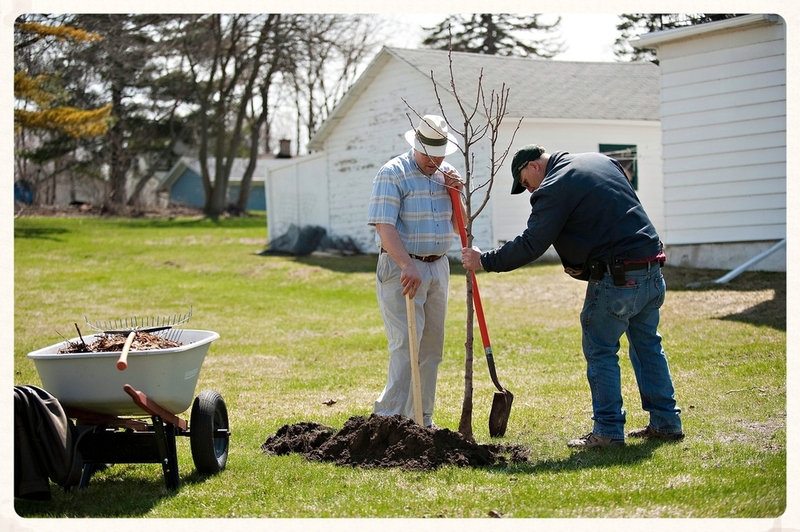 We work with the Wisconsin Department of Urban Forestry to plant trees in cities, villages, and townships to promote Wisconsin's healthy urban forest. For every individual that pledges to use a Northwoods' casket or cremation urn, we Plant it Forward by planting the trees at our next spring or fall planting. Consider Planting it Forward with us today! A craftsman makes a living for two days. Jonas (left) and Harold (right) discussing details. Every one of our caskets is handcrafted in Wisconsin. We have several craftsmen on our team--11 making caskets, cremation urns, and furniture at the time of this writing--who work in their own workshops with their own tools. On average, it takes two days of work to build a single wooden casket shell. Our craftsmen work in small batches of 6 to 10 casket shells at a time. By choosing a Northwoods' casket, your family guarantees two days of work for a Wisconsin woodworking craftsman. Our seamstress, Sally, always smiling. A seamstress makes a living for one day. Each casket is carefully tailored and upholstered by our full-time seamstress. We use only biodegradable and natural fabrics. On average, it takes about one day to make the parts and fully upholster a casket. By choosing a Northwoods' casket, your family creates one full day of rewarding work for our seamstress, Sally. A wood finisher makes a living wage for one day. We take great care in all of our finishing techniques to be good to our team and the environment. This means that none of our finishes contain toxic or harmful chemicals, and all are 100% VOC free. This also means it takes patience and 6-10 days of drying time to put the finishes on our caskets. Rediscovering the wood finishing techniques once mastered by 15th century craftsmen has been both challenging and rewarding. This is a skilled job for two of our part-time team members. On average, there is a full day of labor in between those 6-10 days of drying time. By choosing a Northwoods' casket, your family creates one full day of a living wage job for a finisher. Jeff applying a white milk paint glaze finish to a raised panel oak casket shell. The carbon footprint of your funeral is reduced by 1600 to 2000 lbs of CO2. Every activity on the planet either sequesters or emits carbon dioxide and other greenhouse gases that can be measured in pounds (or tons) of carbon dioxide equivalents (CO2e). Trees and plants use photosynthesis to sequester CO2 from the air into plant mass. When we consume energy or burn fossil fuels to produce things we emit carbon. The carbon footprint to produce and transport a typical steel casket is 2000 lbs. of CO2e. A manufactured wood casket is 1600 to 2000 lbs. of CO2e. By locally sourcing sustainably harvested woods, air-drying the lumber, tailoring with natural and biodegradable fabric, and finishing with eco-friendly natural oils and milk paint, a typical Northwoods' casket has a carbon footprint of about 200 lbs. of CO2e. (Our Simple Pine Box is less than 50 lbs. CO2e). Jonas Zahn planting a tree on Center Street in the City of Beaver Dam. And then we plant those 100 trees! Those 100 seedling trees sequester 200 lbs. of CO2 in their first year of growth. After 20 years, those trees continue to sequester more than 2000 lbs. of CO2 annually. When your family chooses a Northwoods' casket, you're making a measurable impact in your carbon footprint that will continue to pay it forward for many years. Local support for the city of Beaver Dam and area community. The City of Beaver Dam, Wisconsin is our home. Our casket and furniture company resides in the city's downtown. Our team is active in downtown revitalization efforts, tree planting, and beautification projects. The Northwoods Casket Co. regularly contributes to local non-profit organizations including Downtown Beaver Dam, Inc., Beaver Dam Area Arts Association, Beaver Dam Area Community Theater, Beaver Dam Lake Improvement Association, as well as local churches and schools. Every member of our team participates in community events. When your family chooses a Northwoods' casket, you help support a healthy local economy and community. Planting trees with kids for Arbor day at Washington Elementary School.